3 of us took on the challenge of Carrauntoohil in July 2012. It most definitely was a challenge! We parked at the carpark V771 870 A to take the hydro road up to Coomloughera Lough. Unfortunately the cloud descended on us as we drove to the start point, it was thick and very wet and enveloped up from as early as half way up the hydro road. We had intended to take on the full horseshoe however we decided not to push our luck with the conditions. We stuck to the direction and continued anti-clockwise across the sodden ground at the lakes level where you'll reach the start of the ascent proper. From here it was a very long, tough trek all the way up to Caher west and then Caher. 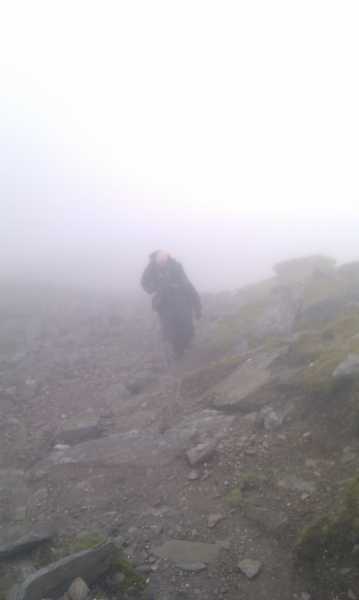 We continued from here towards Carrauntoohil which took roughly 40minutes alone. When at the top we stopped for drinks and snacks and enjoyed some other trekkers surprising one of their group with a birthday cake! The cloud stayed with us for almost the entire trip, only lifting as we descended to reveal the 2 lakes within the horseshoe. The ground underfoot went from some very wet boggy conditions to clearly worn trails. All in all the slow return trip took us 7 hours, with more stops than i care to mention to check our bearings and rest up.